As travel writers, we are continually taking our sweet doggies to stay with a friendly dog sitter while we travel, but it’s always hard to say good-bye, especially when they look at us so forlornly as we drive away. So when the Hofsas House in Carmel-by-the-Sea invited us to experience their dog-friendly package, we jumped at the chance to take our two middle-aged cocker spaniels with us. 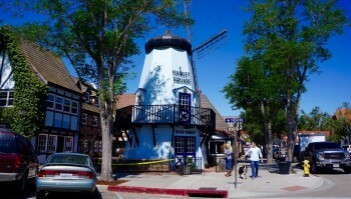 We wisely decided to stop at another favorite California town, Solvang, on our way up the coast. 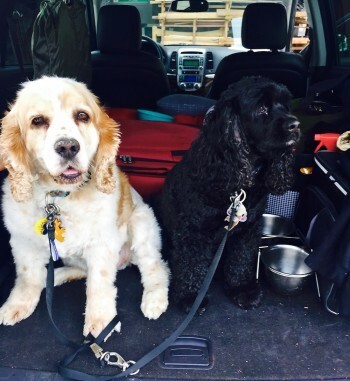 When we told Catie and Chester they were invited on a trip, they happily wagged their tails. They always know that when we get our suitcases out, it probably means they will be left behind. (We can tell because they openly sulk.) But we told them that this time they were going along and they seemed to understand. It must have been the upbeat tones in our voices. Catie even jumped in my suitcase. At the end of this article, we offer some tips about traveling with dogs. It does take special attention and preparation to make a doggy road trip successful. After packing up the car with dog beds, dog food, dog toys, dog dishes and dogs, of course, we hit the road. Chester and Catie were initially excited, but they soon settled down for a long snooze. Fortunately, they are great car travelers. 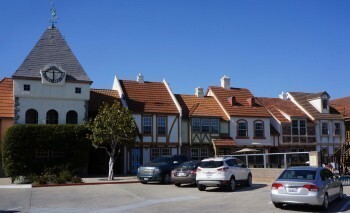 Solvang, which is located about 30 minutes from Santa Barbara, was about a four-hour drive for us. We have been to this charming Danish town before, although never with dogs, but we had heard how dog-friendly Solvang is so it seemed a logical first stop for this dog-focused trip. About a four- or five-hour drive is ideal when traveling with dogs. Any longer and they may become restless. We were particularly happy to be traveling to Solvang again since it was just named one of America’s “Best Historic Small Towns” in a travel award contest sponsored by USA Today. 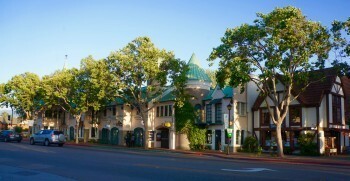 Solvang’s rich Danish-American heritage is reflected in the architecture, food (particularly bakeries), and shops in the area. 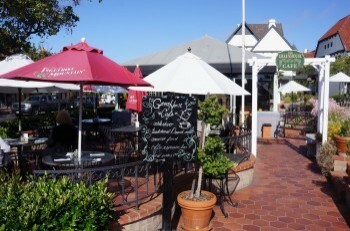 Whenever we’ve been in Solvang, we feel like we are in a European village as we wander around its picturesque streets. We hoped our dogs would be impressed too. We checked into the dog-friendly Royal Copenhagen Inn, ideally located right in the heart of town. The inn is designed to replicate a Danish neighborhood, just as you might find in Copenhagen. Our two-story suite was spacious, comfortable, and nicely decorated with a Scandinavian flair. There were Danish cookies waiting for us in the room along with special iced doggy cookies, which the dogs quickly devoured. The Inn has a lovely fenced garden area for walking dogs and also a beautiful pool for doggy parents. The Royal Copenhagen has special rooms designated for dogs and charges $20 per dog per night. When making a reservation, be sure you indicate that you’ll be traveling with your dog. 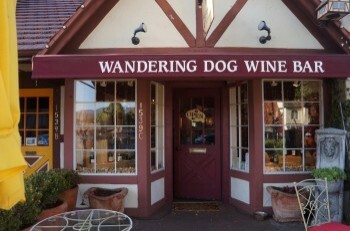 There are more than 20 wine tasting rooms in Solvang and almost all of them welcome dogs. Carivintis Winery, owned by Fleet and Diane Hamilton, was a great experience for Chester and Catie. While we enjoyed wine, our dogs relished homemade dog biscuits made by our amiable tasting room host, Beth Badrak (who is also known as Diva del Vino). All the Carivintas labels feature animals and wildlife scenes. The Fleets created their winery to be pet friendly because of their own love for animals. We were pleased to learn that a portion of Carivintas' profits goes to charities, particularly those that support animals, such as local animal shelters. And the wines we tasted were superb, particularly the 2012 Pinot Noir and the 2013 Syrah. 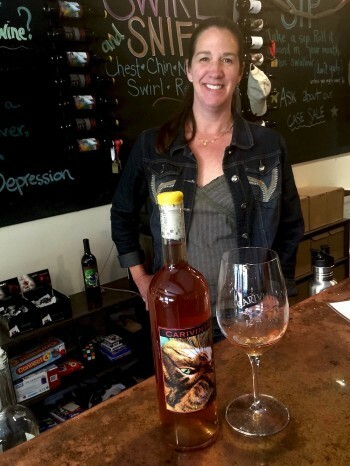 Our hotel offered us complimentary tastings at Presidio Winery's, nearby stylish tasting room. While the dogs took naps at our feet, we especially enjoyed the 2012 Viognier and the 2014 Pinot Noir served to us by friendly Douglas Braun. 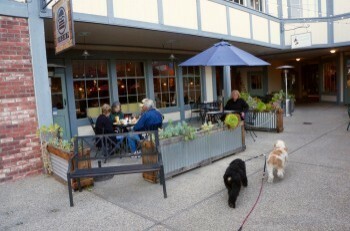 We had dinner at Chomp, a burgers, fries and shake place that welcomed dogs on their outdoor patio. The juicy, flavorful burgers hit the spot after an afternoon of wine tasting. The chef fixed the doggies chopped chicken breast and they were as happy with the food as we were. We met the personable owner of Chomp, Aaron Peterson, who talked with us about his love of Solvang and dedication to providing good casual food for his guests. 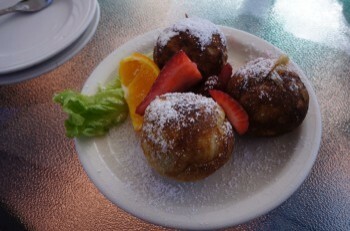 Our stay in Solvang was all too brief, but that means we’ll be going back. After breakfast we stopped at a few of the many appealing shops and then hopped in the car for our four-hour drive to Carmel-by-the-Sea. Stay tuned for an upcoming story about our visit to Carmel as our doggie road trip continues. • Certain dogs just plain should not be traveling with you. If your dogs are barkers or biters, leave them with a dog sitter. • Make sure your dog is healthy before you leave and is up-to-date on immunizations. Carry immunization records with you. • Make sure you’ve taken some short trial run car trips to see if your dog is a good car traveler. Some dogs are very nervous and jump all over the place. After a few car experiences, most dogs will become accustomed to car rides and calm down. • Traveling with dogs is a lot like traveling with children. You may want to bring along their beds, favorite toys and even dog dishes to make them feel at home. • Make sure you have researched your destinations ahead of time and that you have reservations at dog-friendly hotels that are aware you are bringing a dog. 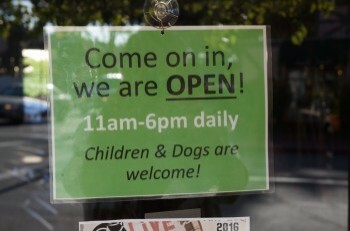 A site called “Pets Welcome” can help you in your search for dog-friendly hotels all over the USA and Canada. • Don’t ever leave your dogs alone in hotel rooms. Some people may disagree with this, but many dog friendly hotels require that dogs not be left alone and we wholeheartedly agree. You never know what might happen in your absence. Even the calmest dog may start barking or tearing up the room when left alone in a strange place. And you never know whether hotel staff may enter your room while you’re out and unintentionally let your dog out of the room. When you travel with dogs, just accept the fact that they will be going everywhere with you. • Try to keep your dog’s routine similar to home routines. If possible, feed dogs at the same time each day with the same food they expect at home. And always make sure dogs have been fed before you take them out to a restaurant. • Make sure you stop frequently. Try to avoid potty breaks at gas stations and look for green grass in parks or rest stops. Always carry doggy bags with you and use them when necessary. Always keep your dog on a leash when out of the car. • For long trips, harnesses that clip to seat belts are a worthwhile investment. You don’t want your dogs flying through the windshield in case of a sudden stop or accident. • Try not to drive more than 4-5 hours a day. • Relax and have fun with your dogs. Talk to them. Tell them where you are going. They understand more than you think and your tone of voice will keep them feeling contented and secure.